1.5 How to Apply for Panchayati Raj Recruitment 2017 Telangana? Here is a good news for all the unemployed candidates that the officials of Panchayati and Rural Development have released a notification through an editorial in a newspaper. The P&D Minister of Telangana State KT Rama Rao has decided to fill the vacancies of 480 Assistant Executive Engineer, Dy. Executive Engineer, and other posts. So, the state government gave permission to Telangana PSC to conduct this Panchayati Raj Telangana Recruitment 2017. Hence the candidates who were looking for Government Jobs in Telangana must utilize this opportunity. All the Interested and Eligible candidates can apply for these 480 Jobs in Panchayati Raj Department Telangana through the official website, i.e., www.tspsc.gov.in. Here on this page, we have given the details of post wise TSPSC PRRD Vacancy, required qualifications, Application Process, etc. of Panchayati Raj Recruitment 2017 Telangana. Candidates applying for Telangana Panchayati Raj Recruitment 2017 should satisfy the eligibility conditions mentioned in the official notification. 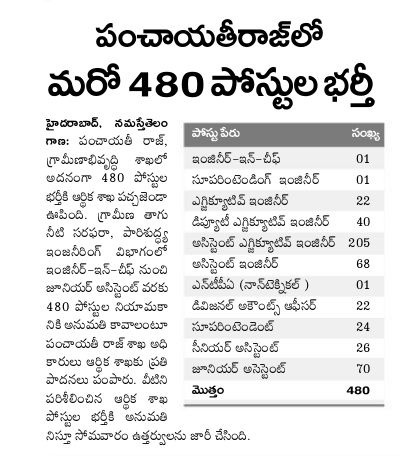 Only those candidates who were found eligible for these 480 Panchayati Raj Jobs in Telangana must apply before the last date. The age limit and educational qualifications required for this Telangana PRRD Recruitment 2017 are as follows. The age limit of the candidates applying for Panchayati Raj Telangana Recruitment 2017 must be between 18 years to 36 years. However, age relaxations are applicable for reserved categories as per the rules of the Telangana Government. A Bachelor’s degree in the relevant field from a recognized Board or Institute is essential to apply for Panchayat Raj Recruitment 2017 Telangana. Postulants of Telangana PRRD Notification 2017 must be aware of some details like Selection procedure, pay scale, application fee, etc. before applying. So, for your convenience, I have given all these details in the below section. The officials of TSPSC will select all the candidates of TSPSC PRRD Recruitment 2017 based on their performance in the following rounds. All these rounds will be conducted by the officials of Telangana Public Service Commission. Aspirants of Panchayati Raj Telangana Recruitment 2017 need to pay the application fee in online mode along with transaction charges. Refer the official notification for fee details as per your category. All the selected candidates of Telangana Panchayati Raj Recruitment 2017 will get the consolidated monthly salary, with grade pay, and all other allowances as per the norms of the organization. Also, the TSPSC Panchayati Raj Exam date is not yet confirmed. So, whenever the officials release the notification of TS Panchayati Raj Recruitment 2017, we will update the same on this page. Hence, I advise all the candidates keep visiting this page regularly for more updates regarding the TSPSC PRRD Notification 2017. How to Apply for Panchayati Raj Recruitment 2017 Telangana? Click on Direct Recruitment section available on the right side of the homepage. Search for Telangana Panchayati Raj Notification 2017 link from the list. Read the notification thoroughly before applying online. Now click on the Apply online link of TSPSC Panchayati Raj Recruitment 2017. Enter all the details correctly as per the instructions. Verify all the details once and click on final submit button. If you found this article about Telangana Panchayati Raj Recruitment 2017 was helpful for you, please do share with your friends. Also, Stay tuned with our www.entranceexams.io site for more details about all Entrance Exams, State Govt, and Central Government Jobs in India.